"Quality First" has always been Vadas International's motto in customer service. Quality is not just a slogan, rather the lifeblood of the company. In today's electronic components distribution industry, Vadas International, as the preferred supplier of the world well-known enterprises, take strict quality control as the key to our success. Vadas International has all along been committed to the "Zero Defect" quality management system and we have established a comprehensive quality management system, from supply chain management to single transaction monitoring, from suppliers grading system to quality inspection procedures. Since the introduction of ISO9001: 2000 management system in 2007, Vadas International has been recognized as the "Qualified Supplier" by many well-known enterprises in the industry. Quality management has infiltrated into all aspects of our work. We keep an insatiable desire for innovation, constantly enrich our quality management system and strive for our "Zero Defect" management objectives. 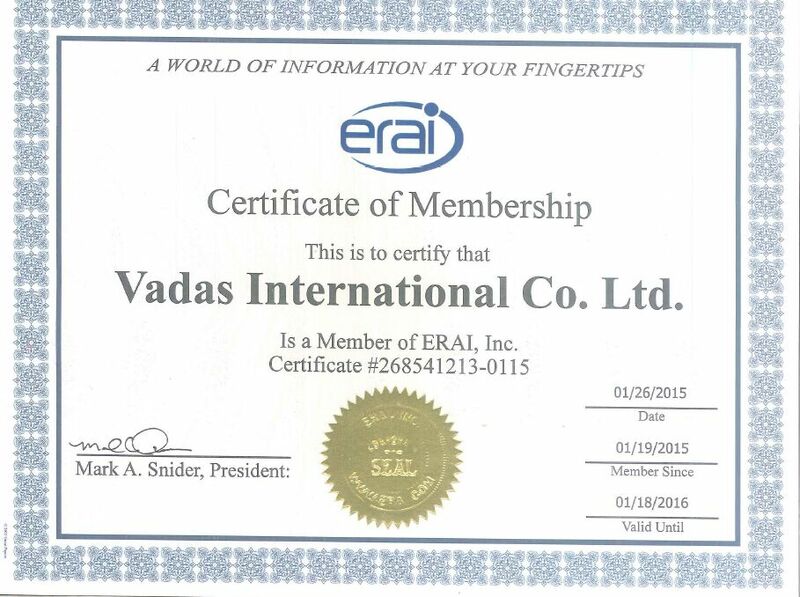 In Feb.2015,VADAS has become an ERAI register member.Founded in 1995, ERAI, Inc. is a global information services organization that monitors, investigates, and reports issues affecting the global electronics supply chain. As the industry’s leading source of risk assessment tools, ERAI provides exclusive services and in-depth information that enable its members to perform industry-specific risk mitigation on suspect counterfeit, high-risk, and non-conforming parts and identify problematic suppliers and customers. Our members include aerospace, defense, medical, nuclear and commercial OEMs, CMs, OCMs, distributors, government agencies and industry associations. As the industrial innovator and leader of quality management, our management philosophy is "Proactive Action". The management strategy of "Start from the channel, Promote step by step" keeps us an invincible position in electronic components supply chain.